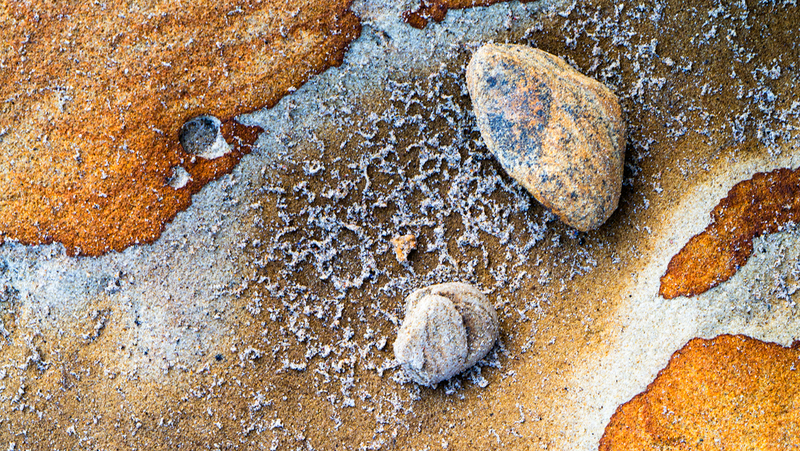 Beach rock detailed captured on a Panasonic GX1 – the right tools for the job make the job much easier. I have to admit that I have never been very good at taking detail shots. I’m not talking here about macro work but about identifying and shooting abstract details and patterns close up. This is the sort of work that photographers such as David Ward have become well known for. It’s not that I don’t appreciate this work, I do; I am actually in awe of people who are able to do this well. I simply struggle to create something pleasant myself. When I look back at the times I have tried this in the past, I seem to struggle to visualise and spot the opportunities. I think this is partly because much of this type of work uses a square format. As much as I like the square format, finding it very balanced, I can’t seem to create compositions within it myself. If I do happen to spot something I then find it difficult to translate this into a composition on the camera. My shots never looked quite right. Recently however I took a trip to Whitby with some photography friends. When the conditions became less than ideal for Landscape work we switched to trying to capture details on the beach. Typically this would be things such as sand patterns and rock details. At first I tried using my DSLR (which I have now sold) but then switched to using the GX1 Micro 43 and Sony RX100 compact camera. Suddenly I found this world opened up to me simply because I wasn’t hunched uncomfortably over a tripod trying to use a DSLR. I found that I was able to visualise and compose much better images by holding the camera away from me and using the image on the back of screen as feedback. Whilst I still struggled to compose images within a square frame, at least I was able to see and appreciate this. I then switched format and surprisingly (because you don’t see it often with detail shots) I found the 16:9 format much more rewarding. Whilst I still have a way to go with producing this sort of work I have at least captured some images that I might be happy to share. I will also be trying this type of photography much more in the future. You’ve captured some beautiful colours and patterns! Thank you. I really appreciate the positive feedback. Beautiful textures and tones in this! Thank you. It means a lot to receive favourable comments for something I’m not very good at.